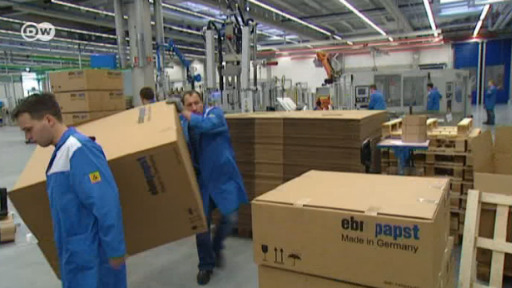 Seasonal factors have caused a decline in Germany's industrial output, official figures show. But economic experts are in agreement that the general upward trend in Europe's powerhouse in not in jeopardy. German industrial production dropped in June, disappointing analysts, who had penciled in a small growth rate. Output fell by 1.1 percent in the month under review, compared with May this year when production rose markedly by 1.2 percent, the National Statistics Office, Destatis, reported Monday. Capital goods makers saw their output drop by 1.9 percent in June, while producer goods production was down 1.2 percent. Consumer goods output declined by 1.7 percent, Destatis said. Industrial production is closely watched by analysts as a strong indicator of a country's economic health. But despite the drop in June, "the business situation in industry continued to revive in the second quarter," the German Economics Ministry said in a statement. It noted that production only dropped in June after five consecutive months of increases. "Industrial orders and indicators for the business climate in Germany suggest that the upward trend in industrial production will continue," the ministry said. Output rose by 1.8 percent for the whole of the second quarter, compared with the first three months of the year. In the first half of 2018, German trade remained on a solid growth path. But is stagnation in July a first foreboding of a slowdown caused by mounting concern over US President Donald Trump's trade measures? Between April and June, the world's second largest economy grew faster than expected as industrial output and consumption picked up and investment remained strong. But the momentum may not last for the rest of the year. German industrial production slumped more than forecast in June and exports stagnated adding to signs that the nation's key manufacturing sector lost momentum at the end of the second quarter. But exports were still up on June 2107.